Darren Steinke, the Travellin’ Blogger, was on hand and posted this piece right here. Tim Pigulski of 701 ESPN Seattle has a gamer right here. The Seattle Thunderbirds began life as the Vancouver Nats (1971-73), then moved to Kamloops and played four seasons (1973-77) as the Chiefs. They relocated to Seattle as the Breakers for the 1977-78 season. After eight seasons, they became the Thunderbirds for 1985-86. Prior to last season, the closest Seattle had come to winning a WHL title was in 1996-97 when they were swept from the championship final by the Lethbridge Hurricanes. Last season, the Brandon Wheat Kings took out Seattle in the final, 4-1. 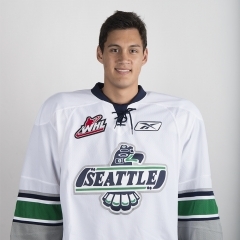 At game’s end, F Mathew Barzal of the Thunderbirds was saluted as the playoff MVP. goaltender to win a WHL championship in his 16-year-old season since Dan Blackburn did it with the Kootenay Ice in the spring of 2000. Blackburn played in 51 regular-season games and 21 in the playoffs. Stankowski, who turned 17 on March 9, is from Calgary. The 5-foot-9, 160-pounder played in only seven regular-season games, going 3-0-1, 2.18, .910. 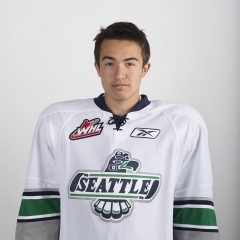 Starter Rylan Toth, 20, who led the WHL in regular-season victories (36), went down late in the regular season. Stankowski stepped into the starter’s role and went 16-4, 2.50, .911. He set franchise records for most victories by a goaltender in one playoff season and most career playoff victories. Stankowski’s performance brings back memories of Blackburn and Randy Petruk. In 1995, Petruk was 16 when he took over the Kamloops Blazers’ starting role during Game 2 of the championship final against the Brandon Wheat Kings. Petruk, who had appeared in 27 regular-season games, remained in that role for the remainder of the season as the Blazers won their third Memorial Cup in four seasons. And then there was the 1971-72 Edmonton Oil Kings. They went 44-22-2 to finish second in the West Division, before winning the playoff title by taking out the New Westminster Bruins, 4-1; the Calgary Centennials, 4-2; and the Regina Pats, 4-1. Edmonton’s goaltenders were Doug Soetaert, who was 15, and Larry Hendrick, 16. In the regular season, Hendrick played in 46 games, with Soetaert getting into 37. In the playoffs, Soetaert played in six games, while Hendrick’s total seems to have been lost in the shuffle. The WHL Guide was first published prior to the 1972-73 season and doesn’t include any playoff goaltending stats from the spring of 1972. F Keegan Kolesar of the Seattle Thunderbirds led the WHL playoff scoring race, his 31 points leaving him one ahead of Regina F Sam Steel. F Reid Gardiner of the Kelowna Rockets, who lost to Seattle in the third round, was third, at 28. . . . F Austin Wagner of Regina led in goals (16), one more than Gardiner. . . . Seattle D Ethan Bear was No. 1 in assists, with 20, one more than Kolesar and Steel.